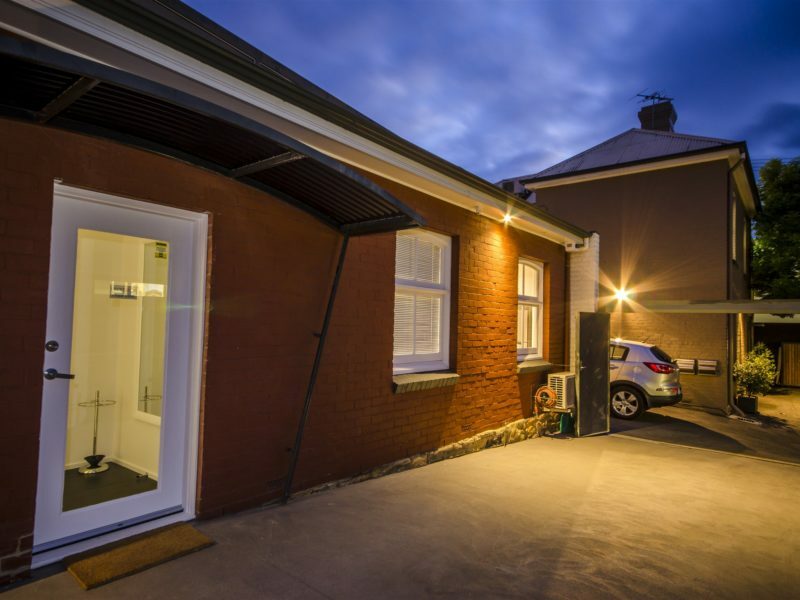 A beautiful split-level, self-catering two bedroom/two bathroom apartment in the heart of Hobart, with free dedicated off-street car park. 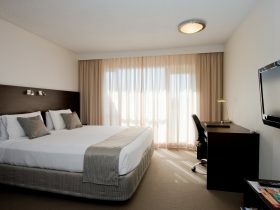 Spacious bedroom retreats, at opposite ends of the apartment, offer calming and relaxing environments after a busy day. Each bedroom has double glazing, block-out blinds, built-in wardrobes, hotel quality beds and linen, electric blankets and flat screen TVs. Perfect for two couples, families of five or five singles. Bathrooms feature blissfully heated floors plus hotel quality towels and toiletries. Cook a gourmet meal with local produce in your fully equipped, modern kitchen, or dine out at a local restaurant or cafe. The dining area seats six and creates a place to gather around with a glass of Tasmanian wine to chat about your day. Read a book, watch TV or a DVD in the lounge area; or check out social media using the Wi-Fi. 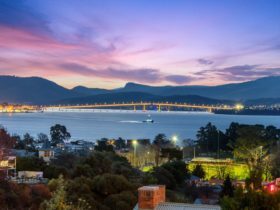 The convenient Hobart inner-city location is your perfect base for visiting friends and family, for business, attending sporting events and conferences, or simply for an indulgent weekend getaway. 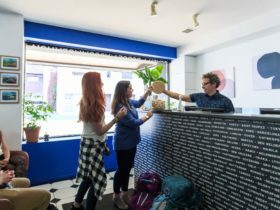 A 6 minute walk to the CBD shopping centre; 15 minute stroll to Salamanca Market and the vibrant waterfront precinct with award winning cafes, restaurants, museums and ferry terminals. 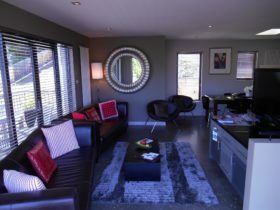 A beautiful split-level, self-catering two bedroom/two bathroom apartment in the heart of Hobart. 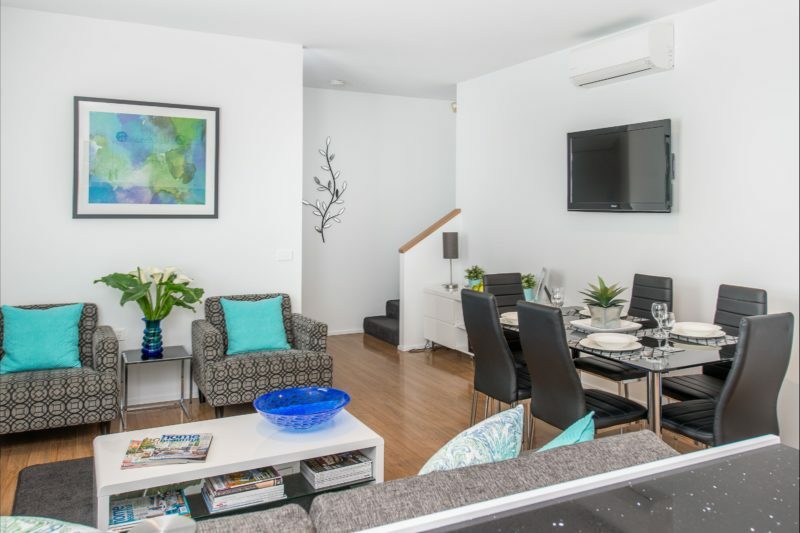 The two spacious bedrooms offer a calming environment to relax in with double glazed windows, built-in wardrobes, hotel quality beds and linen, electric blankets, heating, flat screen TVs and bathrooms with heated floors (bliss on a cold Hobart morning). The bedroom retreats are at opposite ends of the apartment, making it perfect for two couples staying together, or for stays with up to five singles or families of five. 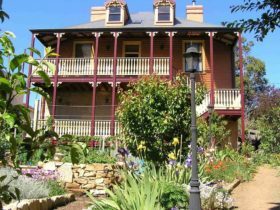 Eat in and cook a gourmet meal with locally sourced produce in your fully equipped, modern kitchen, or dine out at one of Hobart’s many award winning restaurants, or grab a coffee at a local cafe. The lounge and dining areas seat six and it is here that you can gather around the table with a glass of Tasmanian wine to chat about your day. 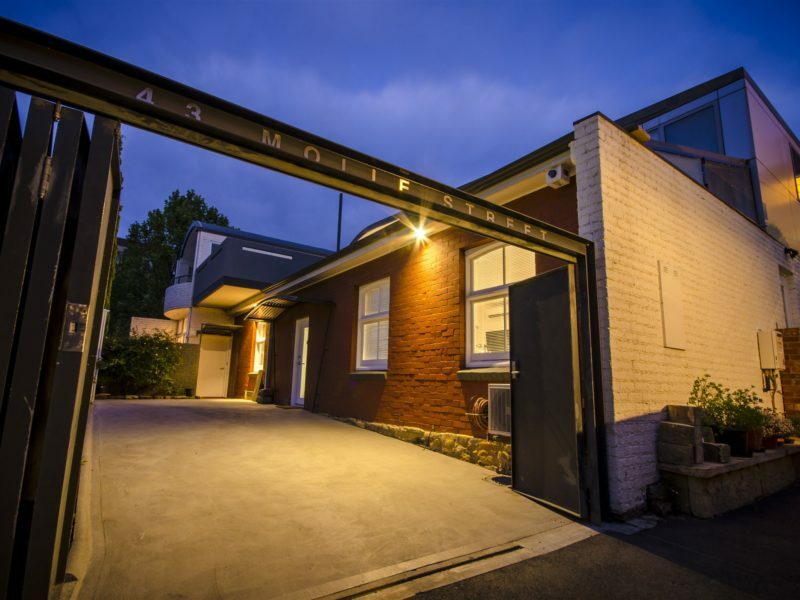 Convenient inner-city location with one dedicated off-street car parking space and Wi-Fi makes this apartment an ideal base for visiting friends and family; business or leisure; attending sporting events and conferences; or simply for an indulgent weekend getaway. 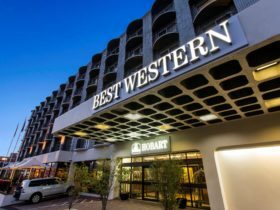 Extra adult/child (under 12) charged at $50 extra per night.